Every year, the Northern New Mexico lowrider community considers Good Friday the coming out day of the season. The community's energy, vibrancy and pride is a beautiful and powerful rite of spring. So much so, that New Mexico Magazine featured the event in it's April issue this year. Unfortunately, the 2018 Good Friday event was interrupted by the Española City Police refusing to allow people to gather. Even for a car wash or a pizza order. 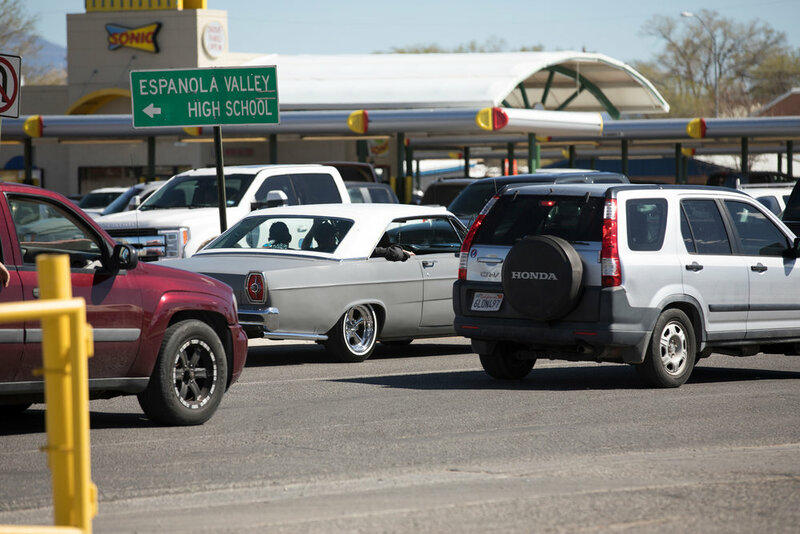 Thankfully, the city recognized it's mistakes on Good Friday and is taking steps towards improving it's relationships with the Española Low Rider Community (see below for words and images from the April 17 meeting between city officials and the car community). The city officials reluctantly allowed me to document the events on Good Friday (after showing media credentials). Many of these photos were taken while driving, if this was about safety, it definitely would have been a safer bet to be able to stop the car occasionally. Eventually some of the day's events found a new home at the local Eagles chapter. The City of Española followed up the questionable Good Friday police behavior with a "Cruise Nights" meeting at the Mision y Convento. The city invited the lowrider community to speak directly to city officials. In attendance was Javier E. Sanchez (Mayor of Española), Kelly Duran (City Manager), Abraham Baca (Interim Chief of Police), The Sherif, members of the police patrol units and city councilors Manuel Martinez and John Ricci. The meeting kicked off with Mayor Sanchez offering a much needed apology to the car community. The meeting concluded with three solid take away actions for both city officials and the car community, but for me ... it was good to see both sides taking the time to see and hear each other.